I received a solicitation in the mail today to visit a privately-owned lender’s web site (which will here remain unnamed, to cover my own rear end…) to get an estimate of how much my student loan payments could decrease if I were to consolidate. Since there wasn’t any obligation to accept the new loan even if you filled out the application, I decided to give it a whirl. I first started off in Safari, which has (with some customizations) become the default browser on my PowerBook. So I got to the first page of the application, and already had a problem. What format did they expect a date in? They couldn’t expect an actual day of the month four years in the future, could they? So I clicked on the little calendar icon… and was met with this pop-up, wanting me to log into an account that I was still in the process of creating. I tried it in Firefox and even the long-outdated IE for Mac, and encountered the same problem as in Safari. Obviously this pop-up was supposed to have a calendar in it— except they hid it behind a registration wall… oops. I then decided to fire up Opera, since it’s known for working with weird proprietary MSIE scripting that fails in other browsers. That gave me this pop-up— except the arrows to select a different month didn’t work. At least I had a clue that they wanted dates in MM/DD/YYYY format now (and yes, the slashes are a requirement), so I filled in a date in May 2009 in the proper format. Doing that removed the ‘Optional’ label from the question about date of final disbursement. I didn’t quite understand the significance of this, since it still wasn’t marked with the asterisk indicating required fields— in fact, I didn’t even notice it at first!— but then, upon submitting the form, I was told it was in fact required, despite the lack of an asterisk (and the reappearance of the ‘Optional’ label!). Really. Did anyone do any user testing on this, whatsoever? If nothing else, at least they could have put a warning that the site only works as intended in Internet Explorer for Windows… though I wouldn’t be surprised if they didn’t even bother to test in any other browsers. Indeed, nowhere in the FAQ or the introductory page of the application is it even mentioned that IE is a requirement! And before anyone goes and criticizes me for using a Macintosh to fill out the form (it’s happened before! ), I should point out that this isn’t purely an issue of Mac marginalization. This lender has put anyone not specifically using Internet Explorer for Windows at a disadvantage; even other Windows browsers will encounter the problems illustrated here, with no obvious warning that anything isn’t working properly. And even beyond the issue of pure browser incompatibility, the form isn’t the best designed, as illustrated with the lack of clarity on whether or not the final disbursement field is required. Found via the always interesting Languagehat blog, here’s an entertaining post on some odd linguistic trends that can be traced to predictive text messaging. I already mentioned this in the comments to the original post, but I’m guilty of one of these myself. I’m sure I’ve confused some people by informing them that I would be good before the hour was out. What I meant, of course, was that I would be home (they’re both 4663), but my phone had no way of reading my mind. Moreover, I’m usually going good by way of the cup— both ‘bus’ and ‘cup’ are 287, naturally. A while back, I posted about how low-resolution some of Google Earth’s imagery was in relatively prominent places. 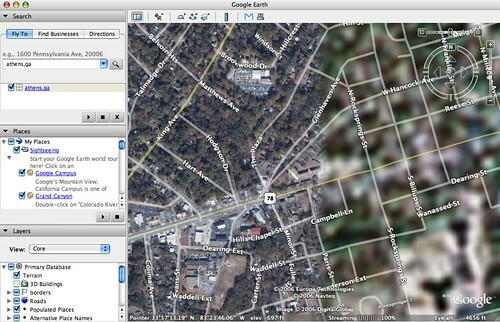 Well, good news: Google Earth has upgraded some of their imagery for Athens, Georgia. By that, I mean everything west of Rocksprings Street is now high-resolution, but everything east of it, including UGA’s campus, is still an utterly unrecognizable blur. Can you use that in a sentence, please? You know those image-verification things (also known as CAPTCHAs) on some blogs’ comment forms, where you have to enter the nonsensical (and often illegible) word displayed in a graphic to prove you’re human? Someone’s taken to coming up with definitions for these words. This sort of thing is right up my alley… I actually did something similar with some Internet friends using names generated by the Fantasy Name Generator. And of course, who could forget Douglas Adams’ Meaning of Liff ? Congratulations also go out to Finola Hackett, bringing Canada all the way to an unprecedented second place in the increasingly international spelling bee— and for not demonstrating any Weltschmerz upon missing that very word. Indeed, everyone in this year’s National Spelling Bee, as in every year, deserves a round of applause; it’s hard enough just to make it to the competition in the first place, and it’s definitely an unforgettable experience.